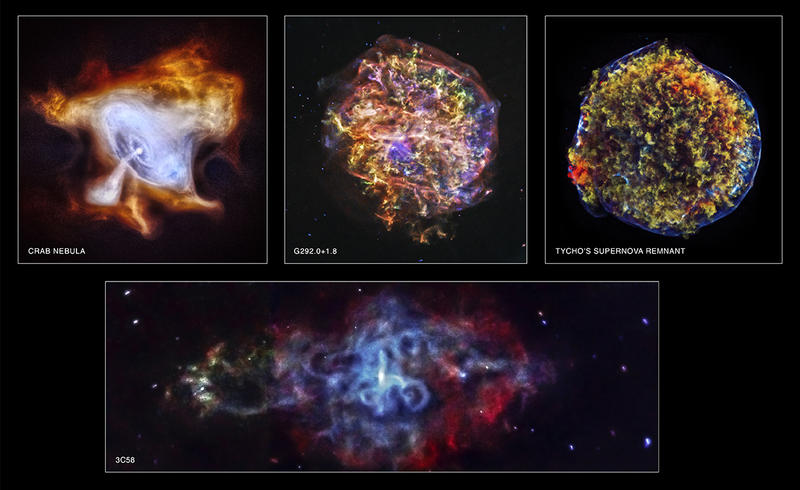 To celebrate Chandra's 15th anniversary, four newly processed images of supernova remnants have been released. The Tycho and G292.0+1.8 supernova remnants show expanding debris from an exploded star and the associated shock waves. The images of the Crab Nebula and 3C58 show how neutron stars produced by a supernova can create clouds of high-energy particles. The images of the Tycho and G292.0+1.8 supernova remnants show how Chandra can trace the expanding debris of an exploded star and the associated shock waves that rumble through interstellar space at speeds of millions of miles per hour. The images of the Crab Nebula and 3C58 show how extremely dense, rapidly rotating neutron stars produced when a massive star explodes can create clouds of high-energy particles light years across that glow brightly in X-rays. More than four centuries after Danish astronomer Tycho Brahe first observed the supernova that bears his name, the supernova remnant it created is now a bright source of X-rays. The supersonic expansion of the exploded star produced a shock wave moving outward into the surrounding interstellar gas, and another, reverse shock wave moving back into the expanding stellar debris. This Chandra image of Tycho reveals the dynamics of the explosion in exquisite detail. The outer shock has produced a rapidly moving shell of extremely high-energy electrons (blue), and the reverse shock has heated the expanding debris to millions of degrees (red and green). There is evidence from the Chandra data that these shock waves may be responsible for some of the cosmic rays - ultra-energetic particles - that pervade the Galaxy and constantly bombard the Earth. At a distance of about 20,000 light years, G292.0+1.8 is one of only three supernova remnants in the Milky Way known to contain large amounts of oxygen. These oxygen-rich supernovas are of great interest to astronomers because they are one of the primary sources of the heavy elements (that is, everything other than hydrogen and helium) necessary to form planets and people. The X-ray image from Chandra shows a rapidly expanding, intricately structured, debris field that contains, along with oxygen (yellow and orange), other elements such as magnesium (green) and silicon and sulfur (blue) that were forged in the star before it exploded. In 1054 AD, Chinese astronomers and others around the world noticed a new bright object in the sky. This “new star” was, in fact, the supernova explosion that created what is now called the Crab Nebula. At the center of the Crab Nebula is an extremely dense, rapidly rotating neutron star left behind by the explosion. The neutron star, also known as a pulsar, is spewing out a blizzard of high-energy particles, producing the expanding X-ray nebula seen by Chandra. In this new image, lower-energy X-rays from Chandra are red, medium energy X-rays are green, and the highest-energy X-rays are blue. 3C58 is the remnant of a supernova observed in the year 1181 AD by Chinese and Japanese astronomers. This new Chandra image shows the center of 3C58, which contains a rapidly spinning neutron star surrounded by a thick ring, or torus, of X-ray emission. The pulsar also has produced jets of X-rays blasting away from it to both the left and right, and extending trillions of miles. These jets are responsible for creating the elaborate web of loops and swirls revealed in the X-ray data. These features, similar to those found in the Crab, are evidence that 3C58 and others like it are capable of generating both swarms of high-energy particles and powerful magnetic fields. In this image, low, medium, and high-energy X-rays detected by Chandra are red, green, and blue respectively. Scale Image is 12 arcmin across (35 light years) across. Scale Image is 4.6 arcmin across (8.7 light years) across. Scale Image is 9.5 arcmin across (36 light years) across. Scale Image is 11.4 arcmin across (about 66 light years) across. It is wonderful to see those photos. Is it possible so see the raw images from Chandra? The colorless x-ray images. Hi Kevin, The blue image being X-ray energies suggests that we could previously see these jets in Radio frequencies, probably through synchrotron radiation from electrons, we now in the X-ray window see evidence of processes with much higher energies, in Direct and reflected Shock waves. It's a privilege to see these - thank you. In The Crab Nebula image, is that really the jet that appears to come out towards the left and down what looks like a whirlpool that swirls around the spinning neutron star? I didn't think that that kind of process was visible except in radio astronomy imaging from 2 billion light-year away quasars.